container decorated with a spunky blue sticker labeled “Graces Gooey”. The lightly golden square still didn’t look like something that could knock my socks off, but more like a butter cookie: plain yet pleasant. Then I had my first forkful. It tasted rich and buttery with a tender texture and just-sweet-enough flavor. This was a refresher course on how looks can be deceiving. Was I successful is making this healthier? Uh, Yes! Even I’m astonished at how wonderful my version ended up being. (Like eating-it-for-breakfast kind of astonishment.) I was able to cut down the calories by 170 per equal size square of the traditional recipes! Even more important for many of us, I reduced the fat by over 16g, and the cholesterol by 68mg. Although I wouldn’t classify this as a health food, I likewise wouldn’t label it a guilty pleasure. We need balance not only in our diets, but also in the way we experience life. Treating ourselves to something special, like a piece of cake, is a way to practice self-care and reward our good food choices from the rest of our day. When we have the bulk of our diets consist of fresh fruits and vegetables, (inexpensive) whole grains, lean proteins, and 8 glasses of water we are allowed to have the treats we crave. So, when people ask me how I eat dessert every night and stay “thin” (whatever that is), this is how: I believe in moderation. I choose to eat as the French do, enjoying a bit of the real stuff, as opposed to a lot of the bad stuff. Eat full-fat real butter. But only have a little and not every day. Have the cake, but make it healthier with less sugar and fat. Drink the glass of wine, but just one. Stay away from things like “Cool whip” that are “low calorie” because they’re manufactured fake food-like products. Avoid pretty much any packaged food labeled “reduced fat”. (It’s scary what they put in there to make it still taste good.) If you do all these simple, little things, I expect you’ll feel less stressed in your relationship with food and look forward to eating without guilt. I can’t stress enough how vital it is to make this a day ahead. You can eat a piece right away, but it will be light and fluffy. OK, I’m not making a convincing argument. Let me put it this way: if you don’t let the squares “relax” they won’t get the “Ooey, Gooey” texture for which they’re named. So, once cooled, cut, and dusted, store them in an airtight container on the counter for a minimum of 12 hours before devouring. Remember to measure your powdered sugar BEFORE you sift it. Confectioners sugar weighs and measures in volume different amounts before and after the clumps are sifted through. What are your regional treats that are unique and maybe not widely known? Comment below! Remove the cream cheese from the refrigerator to a plate and allow to soften while moving forward with the rest of the recipe. Sift powdered sugar. Remove 2 tsp and set aside for the topping. 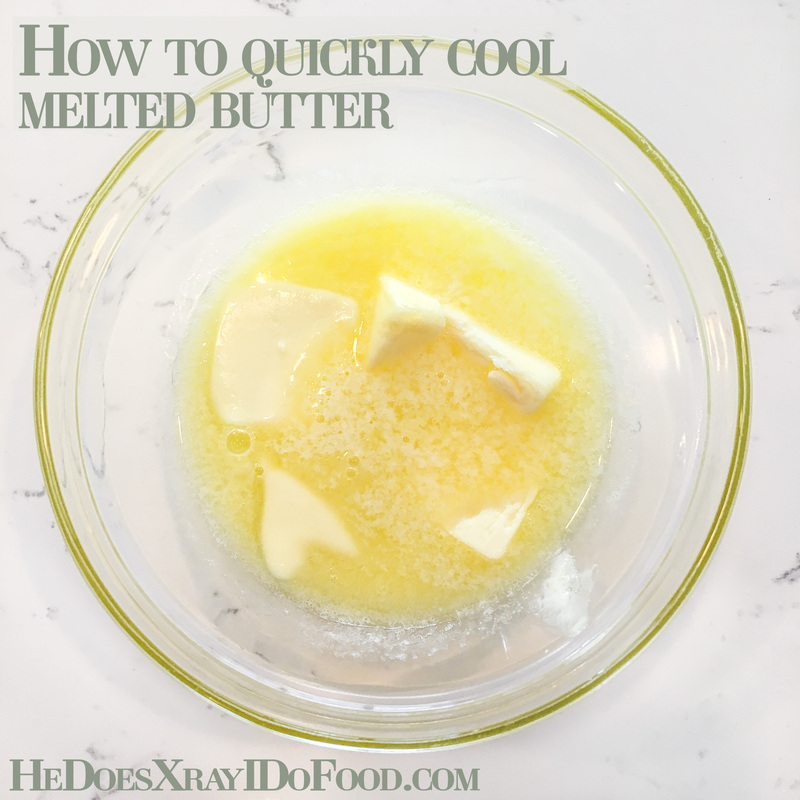 Cut the COLD butter into four or five chunks and place it into a small microwave safe bowl. Microwave for 15 to 30 seconds until the butter is slightly melted but still has chunks in it. See pic. Using a fork stir the butter chunks in until it’s all melted. *This will help to cool the melted butter so it doesn’t cook your egg. Pour the melted butter over your flour mixture and, using a fork, mix it in a little. Then add in the egg white, continuing to mix with your fork and eventually switching over to a spatula. It’ll look sort of like sugar cookie dough when its all mixed together. Spray an 8×8 pan with baking spray or coconut oil and press the dough in an even later, NOT coming up on the edges as you would for Lemon Bars with Cardamom. Set aside. In the same bowl used to make the bottom layer (no need to wash in between), beat the cream cheese on medium-low for about 15 seconds until creamy. Add in your egg, egg white, and vanilla. Mix on low to medium for about 30 seconds until combined. Add in all the sifted powdered sugar (except for the reserved 2 tsp) and mix on low speed to combine. Increase mixer speed to medium and beat for one minute until the mixture is light & fluffy. Pour into prepared pan over the pressed in bottom layer and bake for 35-40 mins. Move the pan to a cooling rack, and allow to cool completely. Don’t rush it because it’ll be a mess to slice and your powdered sugar will melt. Once cool, cut into 9 pieces, THEN sprinkle with reserved 2 tsps of powdered sugar. Store in an airtight container for a minimum 24 hours before eating. (You can eat them right away, but they won’t have the “Gooey” texture for which they’re named. Trust me on this!) These are good for up to 5 days.